The reasons for polynocturia can vary, and it is important to rule out more serious causes before accepting the issue as just an exhausting fact of life. Is it a bladder thing? This requires a doctor visit. Infection, retention, and other causes of bladder dysfunction need to be ruled out as a medical/anatomical cause. Is it a fluid thing? How much fluid is the person taking in before bed time? Restricting drinking a few hours before bed may help alleviate the need to urinate during the night. But be careful of the risk of dehydration caused by over-restricting fluid intake. Allow for normal fluid intake throughout the day, but taper toward the evening. Is it a medication thing? Lots of meds, especially the diuretics, cause frequent urination. A physician can help determine if a medication adjustment is needed and possible. Is it a timing thing? Some bladders function like clock work, and if the bladder thinks 2 a.m. is go-time, there is not much you can do about it. But a healthy bladder can be retrained through timed-voiding techniques. Try waking the person an hour earlier for few days, then another hour earlier a few days earlier… and gradually try to space the voiding events apart. For many people, a 5-6 hour span of rest would be a welcomed relief. Is it a pelvic floor weakness thing? Just like lifting weights can cause biceps to get stronger, so can the pelvic floor be strengthened to help control urination (day and night). A physical or occupational therapist can provide exercises that strengthening the pelvic and hip muscles. There is loads of evidence supporting how well this works for some people. Is it a positional thing? The redistribution of fluid during position changes, particularly from vertical to horizontal, can help the body process and eliminate fluid. Fluid that has accumulated in the lower extremities throughout the day is more easily processed for elimination once a person lies down and gravity is no longer in play. This is a good thing for the body, but an annoyance for someone who is trying to get to sleep. Try elevating the legs throughout the day and lying down an hour or two before bed to start the redistribution process sooner. Have a discussion with a primary physician or a neurologist regarding medication options that may help with sleep issues. Lower your expectations. Although we think of 8 hour spans of solid sleep as “normal”, many older adults do not sleep that long- regardless of brain health. Safety first. Many falls happen in the wee hours of the morning, and most are in the bathroom. Bedside commodes and urinals are great bedside options for frequent urination, but they come with their own messy challenges. Consult with an occupational or physical therapist for safe environmental modifications and toileting options. I was always violently opposed to medicating seniors for the caregiver’s convenience–until I caught myself often driving off the road in broad daylight due to sleep deprivation from my mother’s getting up about 6 times a night to pee. I mentioned it to her primary care physician, who said, “Why didn’t you say something sooner? !” and prescribed a mild (1/2 of a normal dose) medication that makes my mother sleep soundly all night for at LEAST 6 hours and yet remain perfectly continent. You see, a lot of it is in her HEAD. She THINKS she has to go to the bathroom, or is afraid she is not going to make it to the toilet in time, and so is going proactively (if you will). I know this because she can sit through a 2-hour car ride, a 90-minute program, or any number of other things as long as she is interested and engaged. It’s when her attention wanders that she wants to go to the bathroom to pee–often, every 20-30 minutes! The doctor thinks it’s a form of obsessive-compulsive behavior she says she has seen before with Alzheimer’s patients. 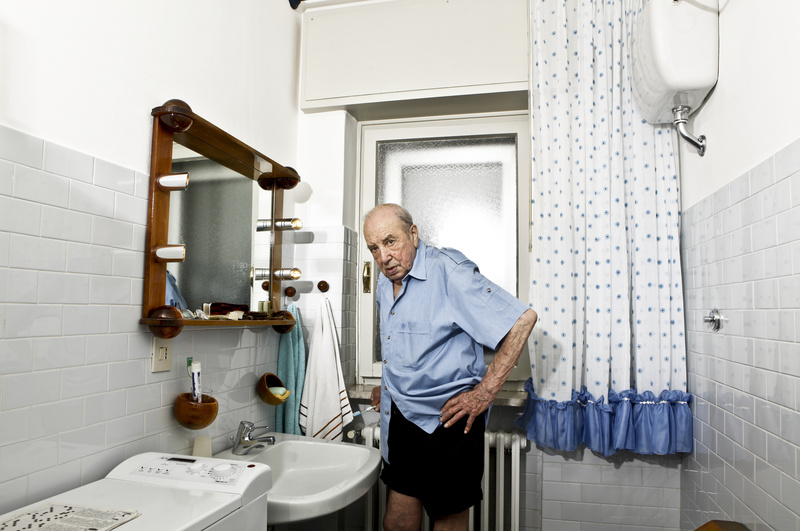 I am just a layperson, but having read about perseveration and repetitive actions–questions, or the same story, or skin picking, or whatever it may be–I have become convinced that frequent trips to the bathroom (when there is no underlying biological reason) are simply another manifestation of this perseveration that dementia patients will exhibit. Thoughts? Yes! Exactly yes. Thank you so much for chiming in! Your website​ is so informative. Thank you for caring! Just as my mother keeps forgetting she had a bowl movement. When I say, you are fine, you had one early. She gets angry because that was “earlier”. I wonder does she expect to sit on the john all day? Ha! That’s funny. Just remember that her sense of time might be impaired, as is her ability to communicate or rationalize what you are saying. Maybe delve into why she’s bringing it up… is she uncomfortable? Does she feel like she has to go? Or if it’s just an idea that she’s “stuck on”, that’s ok too. Hyperfocus on body parts and body functions is common. Just validate “you had one earlier, but let me know if you have to go again” and redirect… “how bout a walk?” Doing a good job Meghan!